Thomas Jefferson wanted the 13 colonies to become a nation. He was a good writer, so he wrote letters asking people to help the nation become free. He wrote letter after letter; 50,000 letters during his lifetime. He was such a good writer that he was one of five men chosen to write the Declaration of Independence. He wanted to be able to think, so he rented a house and stayed there by himself for 17 days. He searched in his mind for just the right words. When he had finished it, he gave it to the Continental Congress, and on July 4, 1776 it was adopted. * The war for freedom; the revolution* had started. Jefferson was born on the family farm in Virginia to a wealthy family. He had six sisters and three brothers; a large family indeed. When he was a boy he enjoyed hunting, fishing, riding horses and canoeing. He also loved music and learned to play the violin. His father was his teacher and his parents talked to him about the importance of serving others. His father died when Thomas was 14 years old. When he was 17 he entered college and studied law. He would make a schedule for himself and study 15 hours or more a day. Because of his hard work, he was at the head of his class. He soon passed the bar exam* and became a lawyer in Virginia. 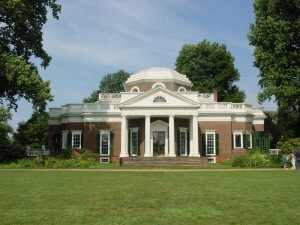 He married and built a home called Monticello (Mon-ti-CHELLO). Later his wife, Martha, died. When George Washington was president, Jefferson was his secretary of state. Then he served as vice president under John Adams. Jefferson was elected the third president of the United States in 1801. His wife died 19 years before he became president, so there was no "First Lady". * Sometimes his daughters served as hostesses. * Dolley Madison, the wife of his Secretary of State, was also a popular hostess in the White House. He knew the country had to grow, so he completed the Louisiana Purchase which doubled the size of the nation. After two terms as president he returned to Monticello and farming. He grew hundreds of different kinds of vegetables and fruit trees. He knew education was important, so he planned the University of Virginia. He designed the buildings and marked where they should be built. He also chose the library books, and even hired the teachers. The school opened in 1825 with 40 students. Thomas Jefferson died 50 years after the adoption of the Declaration of Independence. 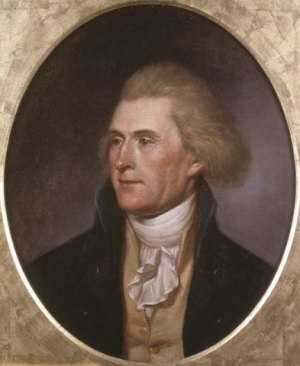 to accept formally as in "the assembly adopted a constitution"
At biography.com search for Thomas Jefferson. Press "Go" to search for books about Thomas Jefferson. Thomas Jefferson: Let Freedom Ring! 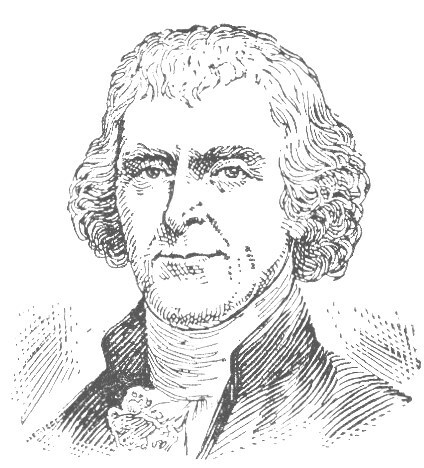 "Thomas Jefferson, A Character Sketch"
The portrait of Jefferson may be used without permission. It is in the public domain and was found at the Wikimedia Commons. Picture to color courtesy of Wikimedia Commons. I l love this website! its the best. ROFL!!! Awesome! Really helped for southern colonies eminent person! thank this really helped on my notables project!!!! This page displayed 359,755 times.